My husband told me that there is an old wives tale that whatever you do during the first week of the year, you will do the whole year long. He passed on this bit of information because there was a deduction in the checkbook for purchases at Wal-Mart 8 days running. That was due to the Pscho Cold. And my desire to get only what we needed right then, in high hopes that the next day we would be better. Because I am an optimist. Which is why those old wives and their dumb ole tales don’t bother me. The first week of January wasn’t the only trying time for our family. It has continued throughout the month. Many of my blog readers are also my friends on Facebook and already know this (side note: Facebook is losing some of it’s draw for me. Breaking my life down into three sentences is getting old and shallow), but for the four of you who don’t know, the spunky two year old stepped on a sewing needle a week ago. I pulled it out of his sock, saw that it was broken, and since there was no blood and very little crying on his part, I assumed that he had stepped on a broken needle. Sure he complained about his toes hurting, but that was only when we told him he had to eat his carrots or something. Other than that, he never slowed down. Until Sunday. When we arrived home from church, we took his shoes off and he started complaining a lot. Then he started walking funny. Really funny. After his nap, as the rest of the family trotted off to church, I plopped on the couch with some Coco Butter Solid and started to message his toes, moving them back and forth, thus proving to myself that there was nothing wrong. He was simply being dramatic. However, when my husband returned home from the evening service and we were talking, I noticed that the side of Spunkster’s foot looked a little swollen and a bruise had appeared. Upon further inspection, I found a bump. Suddenly my mind went to some scary places. Like to a story that my husband had recently told me about a girl that was thrown from her very gentle horse and rushed to the doctor only to find that, though the fall had not caused any serious damage, she had kidney cancer. I was positive he had a tumor in his foot and some how stepping on the needle had irritated the tumor. 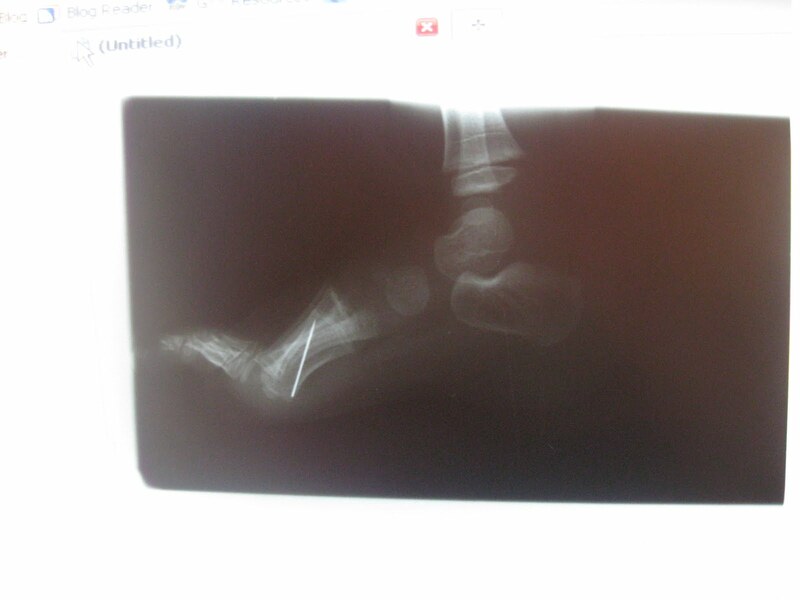 The next morning, I was able to get him into the doctor’s office first thing and they x-rayed his foot. I cannot begin to tell you my emotions when I saw this. Now folks, I am not a crier when big things happen. Nope. I am the calm one. I look at things analytically, think of the best possible way to proceed and then do so. This has always rattled my husband. For a long time, he thought that I was really heartless, until he realized that was simply the way I deal with catastrophic news. But not this time. I started shaking really hard and I began to cry. The doctor, and her student, slowly backed out of the room, telling me that they would give me some time alone. That appointment started a chain of events that ended yesterday with a trip for Spunkster to the OR to get the needle removed. It has been a long month. One of my close friends told me that, like Job, I had been counted worthy to suffer. I laughed. I did see her point, and yes, there has been suffering, but later, in the quiet moments I had I as put about 300 miles on our van this week, I thought about what I had been reading in Job. He had some rotten friends. R.O.T.T.E.N. And these friends had some very unbiblical notions. Like this doosey: Bad things happen to you because you are sinning. Now, do bad things happen to people that sin? Yes! But does it necessarily hold true that when bad things happen, it’s due to sin in your life? Absolutely not. Yet there are those that hold that view today. Whenever I hear that, I always want to ask how they interpret this verse. Really, could it get any clearer than that? I don’t think so. That’s one very good reason why we need to be in His Word daily. Because it is through this Word that He reveals our sins. His glorious light illuminates those dark areas. So, with one more week remaining in January, I am hopeful that these trials are over for the time. But if not, I can say I am very glad that, unlike Job, I have amazing friends. Friends that pray and encourage, and most importantly, think biblically. This entry was posted on Thursday, January 21st, 2010 at 1:30 pm	and tagged with about me, bible reading, God's Awesomeness, obedience You can follow any responses to this entry through the RSS 2.0 feed. I pray my year is NOTHING like the first month of the year. :^) I don't think I can handle a full year of all this. But God knows what I can handle. My husband and I thank God daily for the motorcycle accident. I know most would find that strange, but we do. There is a reason for everything even if we don't understand what that reason is. Thank you again for a wonderful post. oh the xray! that turns my stomach! (((hugs))) to the both of you! if God was chastising you for something, you would know it RIGHT AWAY. there is good that comes from trials and some lessons that can only be learned through difficulty– if we would only open our eyes to see it. it's like being in school– not always easy, not always fun, but part of growing and maturing. you are a great mommy!